Older vets to post-9/11 vets: 'We had it harder.' Did they? 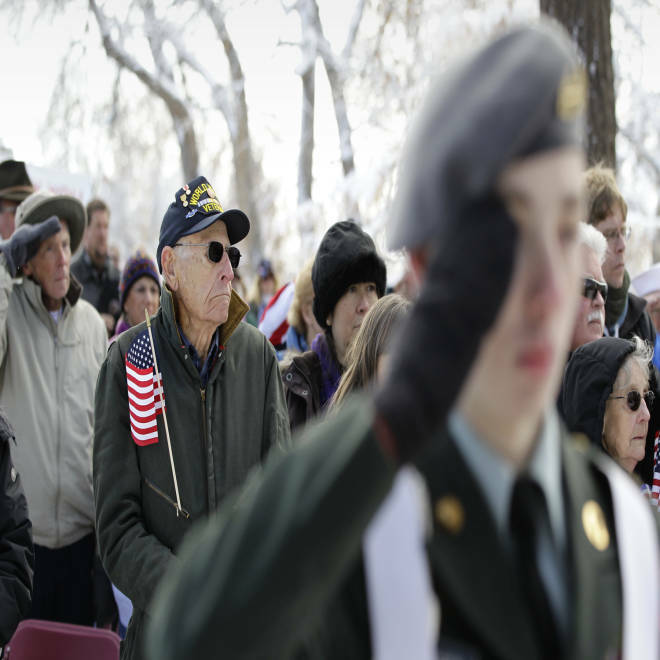 World War II combat veteran Ben Kauffman, 86, carries an American flag as he listens to a speaker during a Veterans Day ceremony in Loveland, Colo., on Nov. 11. Cultural fault lines clearly run between the generations that saw action in different conflicts or that wore the uniform in different eras, including peacetime. The war stories from his grandfather, though sparse in detail, blended one moment of explosive drama with a vague reference of death — all wrapped around a description of how old-school military men used to handle both experiences. “He said he just dealt with it all. It’s that same mentality: ‘I did what I had to do. I got myself better then I went back to work.’ Other than that, he never spoke about the wars at all. That tells me he never did deal with it,” added Weidman, 32. It is, quite likely, a tradition that hearkens back to the Civil War or possibly the Revolutionary War, according to some ex-service members. But many post-9/11 veterans who have chatted with older veterans revealed the sentiment they've often heard carry the same note: “We just came home, put our heads down and got to work — without any whining." Buried, not so subtly, in that message is that the current crop is a tad less tough and lot more needy. Some of that cultural gap may have to do with how aging veterans were taught not to talk about combat stress whereas today's military members are constantly urged to open up about any symptoms of anxiety they're feeling. It's a battle of Macho circa 1945 or 1970 versus Macho 2012. This age-old cultural chasm between military generations has been further fueled in recent years as the modern American armed services welcomed far more women into its ranks (about 15 percent are female), and as the federal government repealed the "Don't Ask, Don't Tell" policy, which barred openly gay people from serving their country, modern veterans say. “Human nature is that we all resist change, especially as we get older. The cultural changes, especially within the military, are hard to swallow by some people my age,” said Craig Roberts, who served as a carrier-based Naval pilot, flying missions over Vietnam from 1969 to 1971. “I’m in my 60s now. And (some veterans my age) just take a blanket view of the military as softer now, that it is a less-difficult experience to live through. I don’t think that’s true at all,” Roberts said. “In combat, it doesn’t matter what gender is next to you, the experience is the same. But the generational disconnect among veterans also impacted Roberts and tens of thousands of his fellow service members after they returned from an unpopular war in the early 1970s. “We of the Vietnam era experienced some of that when we joined veterans services organizations — or attempted to join — and many felt rejected by the older fellas there from Korea and World War II,” Roberts said. “Because there was a resentment — they perceived that they had seen more severe combat than we were in. There may be some truth to that. Heroes of long-ago wars find new homes with families across the country through a program that keeps the veterans out of nursing homes or hospitals. While heading an organization that represents more than 200,000 veterans of from Iraq and Afghanistan, Paul Rieckhoff said he’s become well aware of what he calls “a little bit of a sibling rivalry” between generations of veterans. “We all generally stick together (as veterans) but some of it is just more deeply ingrained,” said Rieckhoff, founder and chief executive officer of Iraq and Afghanistan Veterans of America. In Iraq, he served as an infantry platoon leader, leading 38 men on more than 1,000 mounted and dismounted combat patrols. “This is also just the military: Everybody thinks everybody else had it harder than every generation that came after them. You go to Fort Bragg and they'll tell you how much harder basic training was (years ago). That’s always there,” Rieckhoff said. “I think there’s also some some level of fear and apprehension just around the evolution of our culture. It’s happening in the military, too." While some young-old divides certainly exist within pockets of the veteran community, Rieckoff said “a tremendous sense of unity also descends generations." As evidence, he cited the fact that that the chairman of IAVA’s board (Edward Vick) is a Vietnam veteran and that, before Thanksgiving, Rieckhoff received a letter of support from former Sen. Bob Dole, a World War II veteran.